In Sweden köttbullar (meatballs) are made with ground beef or a mix of ground beef and pork, mixed with breadcrumbs soaked in milk and finely chopped (fried) onions, some broth, and occasionally cream. Left: Köttbullar meatballs served Swedish style with mashed potatoes, brown-sauce, lingonberry-jam and pickled gherkins. They are seasoned with white pepper or allspice and salt. 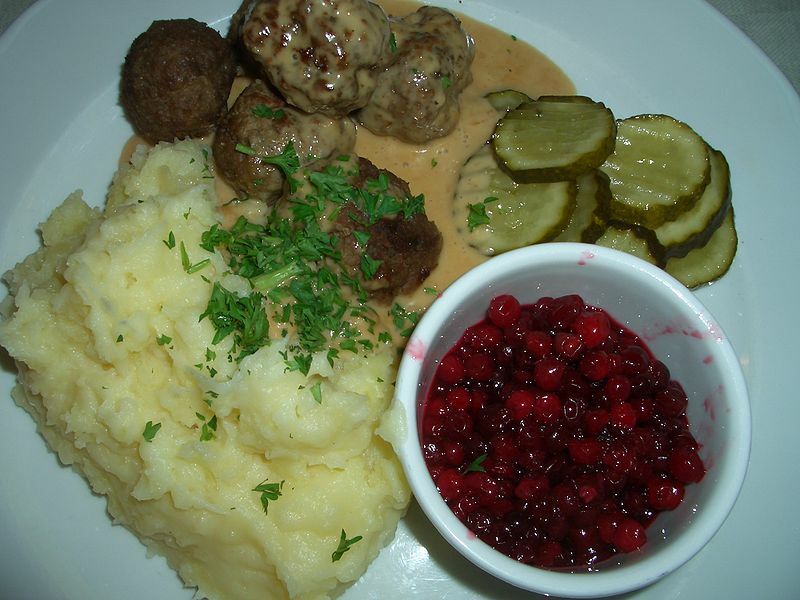 Swedish meatballs are traditionally served with gravy, boiled potatoes, lingonberry jam, and sometimes fresh pickled cucumber. In the United States, there are a number of variations, based on the assimilation of Swedes in the Midwest.